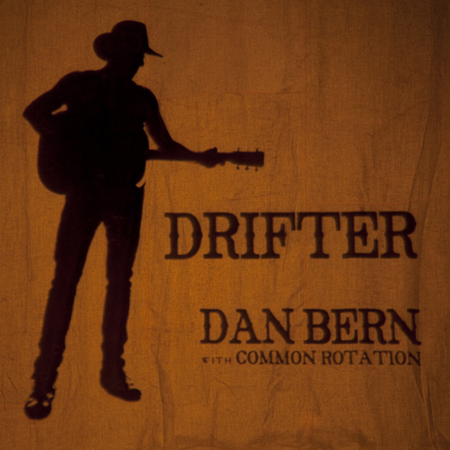 I first heard a selection of the songs that ended up on Dan Bern’s brilliant new record, Drifter in November of last year in the lobby of a refurbished theater in Beacon, New York and then the next day during a promotional live web cast for a magazine in downtown Manhattan. He played a few more at Joe’s Pub in Greenwich Village that night and in late-December at Mexicali’s Blues Café in Teaneck, New Jersey. Separated from the eventual collected work, which both musically and lyrically segues in and out of each song as if psychic travelogue – a yearning to discover, hide, escape and return to a home that is at once geographical and spiritual – it was as if Bern were symbolically ushering the songs through a rigorous performance trial, first solo and then with his new collaborators, the creatively versatile Common Rotation. Later in the winter, as is his wont, Bern sent me a rough mix of the material he wanted to put on the eventual release. For weeks I played it in my office, in the car, and in the background during gatherings of the local tribes, but it wasn’t until late one night that it hit me; this is as close to a running commentary on the American folk ethic as could be laid down in one place; a literal ode to perpetual motion; Jay Gatsby’s ride through the valley of ashes to his unreachable green light at the end of the dock. Drifter is a statement; Bern’s, a generation’s, a genre’s; the effects of traveling on the traveler for good or ill. It is survival. It is change. It is acceptance. Serpentine movement as philosophical, ethereal, political, nostalgic, narcotic, and introspective on tracks like “Luke the Drifter”, “Raining in Madrid” and “Haarlem”, “Carried Away”, “Home” and “Mexican Vacation”, “I’m Not From Around Here” and “Love Makes All The Other Worlds Go Round”, which is the type of denouement that eases seamlessly into the epilogue of “These Living Dreams”. Many, if not all the songs deal with a transitory experience; aging, evolving, moving along through life observationally; it is also replete with an imagining of a better “place” through vivid dreams and visions of hope. A concept record? Nah. Bern was quick to dismiss that on a late-night phone call in March, after I sent him a manically cobbled deconstruction of the record under the influence of my sudden epiphany. Hell, who isn’t swept up in the lure of the road? And what writer (and Bern is nothing if not one) has not tackled its seduction from Homer to Joyce, Horace Greeley to Woody Guthrie, Kerouac to yours truly. Drifter is a singular vision of a journey, the infinite search through snapshots and notations of every can-kicking crossroad conundrum. “Ooh, I do my share, I knock about/Is anything gonna work out”? he sings in the hauntingly beautiful “The Golden Voice of Vin Scully”; as the interior echoes of the radio wave acts as a north star in a desert-scape Californian hymn worthy of Georgia O’Keefe’s pallet. Drifter‘s topographical references are vast. We visit the Milky Way, the moon, Madrid, Hollywood, New York City, Capetown, Johannesburg, North of Seattle to the Mexico line, San Bernardino, Haarlem, the black hills of Ohio/Wisconsin to the Indiana mud, the Canadian border, Philadelphia, West Virginia, and the solar system. Then there is time travel as in “Mexican Vacation”, where a train moves the narrator through the anarchic landscape of a pre-historic American construct overrun with slave-traders as he professes his love for the “runaway slave girl”. A sense of travel even appears when we’re stuck in the obligatory isolation chamber of the traveling musician, the hotel room, which is wistfully depicted in “Party by Myself”. Bern’s bittersweet sampling of embraceable loneliness and mind-altering inertia is not unlike being suspended in outer space or in a capsule, which appears, as in the classic film 2001: A Space Odyssey to be still but is actually moving. Most interesting is Bern’s use of the two-dimensional image of Captain Kirk flickering on the tube; another iconic character set adrift “boldly going where no man has gone before”. Kirk appears, as do all of Bern’s pop culture/historical figure references, brimming with symbolism, not the least of which is his nod to Jonathan Swift who penned the immortal Gulliver’s Travels and for whom the poet W.P. Yeats once described in his epitaph as the “world-besotted traveler”. I count Dan Bern as one of my closest colleagues and in many ways a brother-in-arms. We have tracked the bloody grounds of political and social battles and acted as sounding boards for each other’s work for close to a decade. Both of us have fathered daughters within a few years of each other and watched our generation begin to take charge of all that we railed against in our youth; the destruction of the earth, the systemic killing of innocents, the segmental repression of society, the global economic power-play, and we even managed to elect our own leader of the free world, and yet watch in horror as the madness continues unabated. “Yeah, that’s true,” Bern chuckles, as he usually does when confronted by larger issues before whittling it down to his own corner of the world. “But what’s true at the same time is we’re getting older and we have a feeling of our own mortality; we’re not young bucks anymore.” And then he makes sure I know that he doesn’t feel particularly in charge of anything.”I’m not even in charge of my house!” he laughs. The passion of the search has certainly inspired Bern’s singing. He has never sounded better or more controlled, completely at ease with these wonderfully crafted pieces; each one fastidiously pored over with absorbing precision. Here Common Rotation’s honeyed harmonies and weathered accompaniment on trumpet and banjo (Jordan Katz), harmonica and saxophone (Adam Busch) and guitar and dobro (Eric Kufs) lend the songs a weight they crave, a deserving ensemble for their poetic resonance. The story of the making of Drifter could well have found its way into the work, as Bern and his ensemble, absent the umbrella of a record company this time around, sold songs, studio time, played private gigs and even composed personal jingles for outgoing phone messages for a host of donors all over the country; the time, expanse, and constant dissection of the project adding to its charm. Bern says the sequence of the songs became “like an accordion” for months upon months, jumping the total from 15 songs down to 12 and in some cases just eight and then back up again. “I finally went to Chuck Plotkin (famed producer of Bruce Springsteen and Bob Dylan, as well as Bern’s 2002 masterwork, New American Language) and sat with he and his wife for two full afternoons,” recounts Bern.